Loosemores has been recognised by Cancer Research UK after facilitating over £440,000 worth of gifts from people choosing to leave a legacy to the charity in their will. 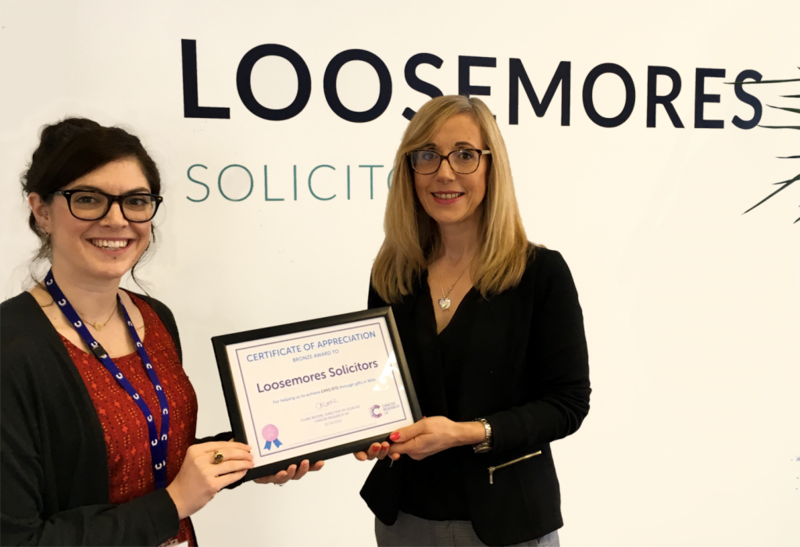 Loosemores was presented with a bronze certificate to acknowledge the firm’s ongoing support. The firm has been offering the Free Will Service to people aged 55 and over in Cardiff for the past 20 years, giving guidance and support for those wishing to write a will for the first time or update an existing will. A legacy gift can be anything someone wishes to leave in their will. Traditionally this is money, but it could be anything that has a monetary value like an estate or specific item. Maria Cosslett is a Fellow of the Chartered Institute of Legal Executives, a member of the Society of Trust and Estates Practitioners (STEP) and a member of Solicitors for the Elderly (SFE).